Grand Admiral Thrawn is coming! 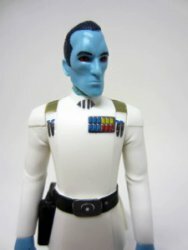 I know, Thrawn just left the building in Star Wars Rebels, but a 6-inch action figure melding his classic novel cover look with the uniforms of Star Wars Rebels is on the way. A normal version is coming for retail stores, and his art collection comes with the deluxe San Diego Comic-Con edition. It's worth noting that the exclusive version will be $49.99 this July, while the normal The Black Series one will be in the usual $20-$25 range. Ask yourself this - why should your toys have a better art collection than you do? It's Grand Admiral Thrawn! It's the first time he's been sold on an individual card this century, and it's his debut figure from Star Wars Rebels. He has a holster, a blaster, and a giant rocket launcher - maybe it's not exactly what you saw on TV, but at least they got the blue right. And he has a nice paint job. And dark blue hair. Read on! The Seventh Sister Inquisitor was shown last February at Toy Fair and started hitting stores about a month ago - along with another shirtless Darth Maul, as is the style at the time. She has a miniature droid, a lightsaber, and a removable face mask. She also has the ability to fall over and has eschewed such elements as foot peg holes. Want to know more? Read on! In case you forgot, DisneyXD still has Star Wars Rebels and the season 3 premiere is hours away. And has Grand Admiral Thrawn. And StarWars.com posted details here if you ignored them earlier because you were too busy playing that AM2R Metroid remake game, and we totally understand. America's newspaper The USA Today posted this preview of the new 2016 Princess Leia Figure as based on Star Wars Rebels which, as should come as no surprise, is based on early concept art from the original movie. It is due this Fall, and I can't wait to buy one! Meanwhile, series stars Sabine and Hera remain elusive. Also, there is no Lando Calrissian toy based on his appearances (voiced by Billy Dee Williams) on Star Wars Rebels. In a headline that tells you everything you need to know, StarWars.com posted this: The Fight Against the Empire Will Continue in Star Wars Rebels Season Three. The DisneyXD show will start year #3 in 2016. No word on what this means for the toys, but the show has certainly been fun to watch this season. If there's one thing you can bet on for Hasbro Star Wars in 2016, it's that you're gonna need a heck of a lot more room. We have uploaded photos featuring Hasbro's The Black Series 2016 reveals yesterday that include a couple of new Star Wars Rebels additions to the 6 inch assortment and a vehicle that can also serve as a coffee table or T.V. stand it's so freakin huge. If you're so inclined, Amazon has Blu-Ray and DVD releases for Star Wars Rebels Season 1 up for grabs. DVD is currently $39.99, Blu-Ray is $45.99. If you're itching to see more of Darth Vader and a bunch of returning faces from The Clone Wars, you won't have much longer to wait. June 20, 2015 - the day Ezra and pals return to Disney XD with a new one-hour "movie!" Click here to read more on StarWars.com.